The boxy white tool truck is hard to miss as it darts around New York City, a bright logo splashed across the vehicle’s side that says, “Good earth. Good eats.” Wherever it stops in the five boroughs, farm-fresh produce and Holton Farms workers with welcoming smiles spill out, bringing a new twist on healthy food for urban residents. The farm truck, a CSA on wheels, is the brainchild of cousins Seth Holton and Jurrien Swarts of Holton Farms in Westminster, Vermont. This innovative approach to direct farmer-to-consumer relationships could serve as a model for helping farmers sustain their businesses while providing low-income residents in urban centers with access to fresh food. Swarts and Holton have infused an entrepreneurial spirit into the historical legacy of their eighth generation farm. “For two years, the farm has been going through a generational transition,” explains Swarts, who manages the New York City operations while Holton runs the farm in Vermont. “Seth and I talked to our uncle and he was ready to let us take over. We made the decision – what can we do to differentiate ourselves?” Now with nearly 400 members and a unique “CSA Select” design that allows customers to select the items they want, Holton Farms has set itself apart. “It’s been quite a learning experience,” says Teddy Winthrop, who has worked on the farm truck since graduating from college. Winthrop’s family owns a tree farm in South Carolina and they are long-time supporters of American Farmland Trust. The Holton Farms unique business model is centered on access, with the mobile farm truck reaching clientele across the economic spectrum in different parts of the city. The truck delivers CSA orders to areas that lack access to fresh, healthy food. 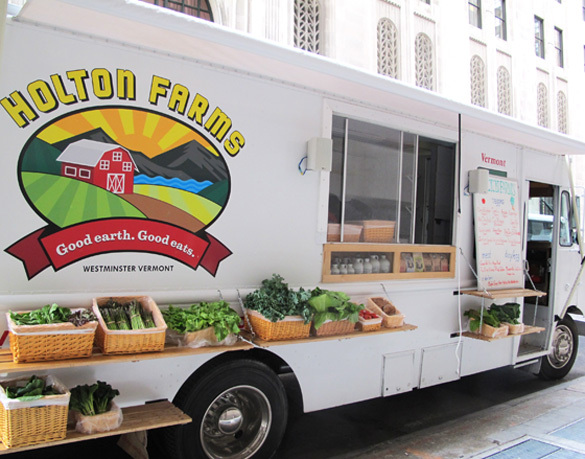 More recently, Holton Farms received their retail mobile-food vending license and can sell food to anyone including low income New Yorkers at subsidized prices. Access to healthy food also requires affordability, and Holton and Swarts understand the value of attracting business beyond their philanthropic goals. 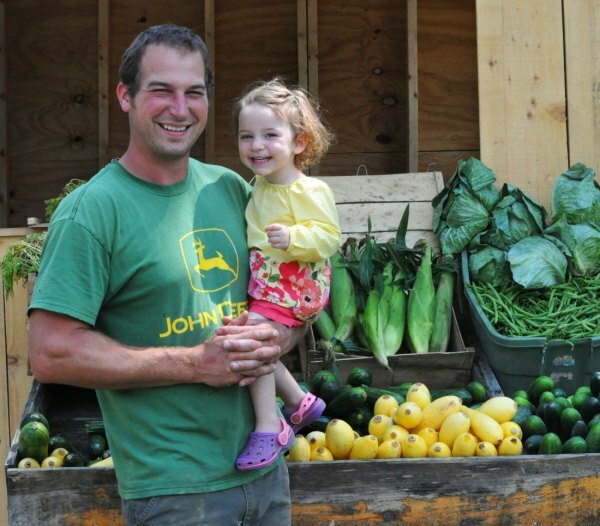 The Holton Farm programs are more than the initiatives of just another start-up. Low-income residents receive a 20 percent discount on CSA memberships, an expense that is subsidized by customers who do not qualify for the reduced price. Even without discounted pricing, a share can cost less than $10 per week during the growing season. The model not only broadens the membership reach but also connects everyone to contribute toward a common cause. For Holton and Swarts, their work goes beyond creating a successful business. “We’re looking to make as big an impact as we can,” Swarts explained. “I left a desk job. Now I can take pride in getting dirty, getting sweaty, seeing the smiling faces of parents getting high quality food for their kids.” And, fortunately for New York City residents, they have only just begun. This entry was posted in Local Farms and Food, New York, States, Vermont and tagged community supported agriculture, Holton Farms, New York City, Vermont on November 10, 2010 by admin. On top of all the wonderful things that Holton and Swarts are doing for agriculture and for their community, it is worth mentioning that Holton Farms is also conserved with the Vermont land Trust. This means that the land will always be in agriculture for future generations of the Holton/Swarts family. Thank you for telling this story which will inspire others to consider access to healthy food for all.